This post has been inspired by the brilliant writing workshop brought to us by Josie at sleep is for the Weak. I've wanted to submit something for ages but you know how time gets the better of you? Tell me about something you miss - a sound, a taste, a touch... something sensual that evokes powerful emotion. - Inspired by Tara's beautiful post in which she laments over time moving too fast: "The one where I learn to appreciate the little things". At the end of last year I 'came out' to lots of people who had no idea about my 'secret' by writing a truly personal post on my journey with post natal depression and whilst I have alway said that if I could turn back the clock, I would still do what I did - the reality is that I miss many things about my old life. Now at 37, I am nearing the point of having lived half of my life dealing with the lasting legacy of my depression. When the summer sun fades and the cold, dark nights set in my mood slips and I start to struggle. I struggle with the rain and the cold and the snow and the effects that the elements have on my patched up body. But I keep my head down and keep on going. After all - I did this to myself. And without the ability to dance a huge part of me went away forever. I miss the feeling that surges through my very essence as the fusion of movement and music take me far, far away. The heat of stage lights. The comfort of daily class, my body moving instinctively from years of re-visiting the same exercises day after day after day. The smell of a sweaty studio and the excitement that it promises and of course the aches, blisters and bruises that run so deep that they are part and parcel of who you are. I miss bending my knees. Even as a dancer I had never before considered that you can't bend your knees if your ankle doesn't work - and why would I? It's just one of those things that you take for granted. But it doesn't you know and that means that I can't jump, lift heavy objects without wrecking my back or dig. To be honest, the digging thing was actually a recent revelation and as it was the first time I'd attempted to dig a hole in the last fifteen years I am cheating by saying I miss it. But believe me, it came as a stark shock and one that I was totally unprepared for as I attempted to bury my cat. I dream of sky high shoe boots and Burberry Prorsum sandals, of brogues and ballerina flats, of Laboutin and Jimmy Choo. Of the freedom to wear anything I want - or even nothing at all. I stare into shop windows with the awe that I felt as a child being dragged past the sweet shop. Wanting but not getting. Every clothing choice that I make, every single day begins with stupid evil shoes, as I weigh up just how long i am going to be able to walk without quietly retiring in pain. And shopping..... Well it's a brave soul that chooses to shoe shop with me as I simmer and deflate in equal measures with every pair set before me. ModelGirl and ModelGirl alone can brighten my mood with her quips of "Too high" or "Too flat", and I wonder how she, at the tender age of seven has skillfully mastered a potential match? When even after fifteen years of looking, I still manage to bring home the most inappropriate shoes at every given opportunity. 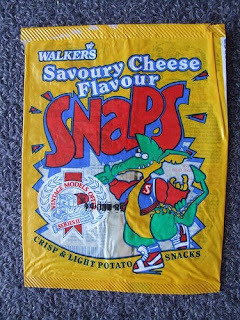 And before I go, I have to admit that I miss Cheese Snaps. I went through a stage of being able to eat a whole six pack in one sitting even though they made my mouth so sore that I couldn't eat anything else for days. Seriously though Walkers... what is it with the Tomato flavour? They just don't cut it. An in an odd twist - that can only be found online.... whilst searching for an image of Cheese Snaps to illustrate my post, I chanced upon a Facebook group with over 3000 members all calling for their return! Seems I'm not the only one to miss the more subtle bits. Lovely post Sian...well written and very touching! Wishing you gorgeous shoes in your dreams so you can still enjoy them. I read this last night Sian but didn't get chance to comment but I've kept thinking about what you've wrote here and have been so moved by it. I don't know whether you know but I was in a wheelchair for many years so can completely relate to your frustrations of your body not doing as you would like it, of restriction and of pain. I know pain very well. But know that you were a dancer, and to read your evocative description of what dancing was to you and how much a part of your life it was, well, it breaks my heart. I'm so sorry you've had to lose this part of your physical self, but am sure you are still a dancer in your heart and soul and hope you can still find ways of bringing that to your life. I can't imagine what an experience watching your daughter dance must be, as I know she does. Such a mixture of pride and pain. Anyway, I talk far too much. Really I just wanted to say thank you so much for sharing this and send you lots of love across the interwebs. This is beautifully written Sian and made me cry a little. I have never heard of those Cheesy Snaps though. Great post!! What a beautiful way to share the emotion of your daily life. Thanks so much for sharing! Oh, and Cheese Snaps don't sound so yummy to me. Hey, Sian, and fellow Blythe sister, let me stop you there. You did not do this to yourself. You cannot do depression to yourself. It is one of life's curses that you did not choose to have. Therefore, you did not choose to damage yourself - you were ill. I have damaged my body as a result of depression. I try not to beat myself up about it for the very same reasons that I am reminding you of now. Battle on sister, battle on. Hugs.